Bill Wyman was born as William George Perks on October 24, 1936. He is best known as bass guitarist of the Rolling Stones, which he was between 1962 and 1992. While in the Stones, he recorded four solo albums, the third of which was 'Bill Wyman', released in 1982. 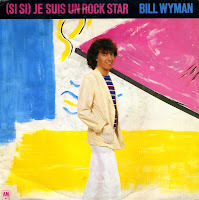 The single '(Si Si) Je suis un rock star' was released in July 1981 and became a top 20 hit in several countries. In the Netherlands, the single peaked at number 13, while in the UK it reached number 14.